The oval was privately owned by Mr Bode who built it in 1889, It was the site for premier sporting events in Wollongong at the time, There was a large grand stand and a pavilion, In 1890 Bode built a half mile horse racing track around the oval. 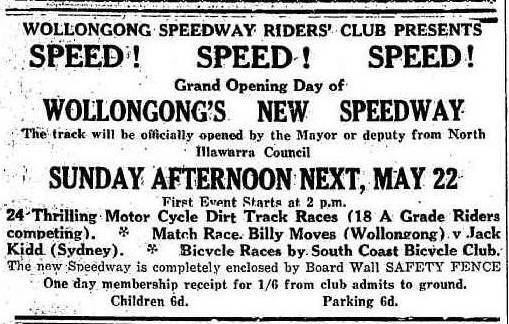 The Wollongong Motorcycle Club was formed in 1937 at Bodes Oval and appeared to organize speedway at the venue, However meetings were first organized by the Wollongong Speedway Riders Club. The track surface was of decomposed granite and the trackside was fully boarded for spectator safety. The first speedway meeting was held on the 16th of January 1938, It was in-fact a show by American Putt Mossman who featured races Australian speedway riders, lady speedway riders and stunts including Putt climbing a ladder on a motorcycle, Putt put on another show on the 30th of January and introduced Midget Speedcars to the circuit. The next meeting on the 13th of Febuary featured top riders and a JAP powered midget verses Putt Mossman on a JAP speedway bike, The first meeting promoted by the WSRC was held on the 22nd of May and was billed as "The Grand Opening", At this meeting Aub Lawson set the track record at 18.80 seconds. Regular meetings were held each fortnight during the racing season, The meetings were well promoted with crowds up to 3,000 attending, many novelty events were run. By the end of 1938 lighting had been installed for night meetings in summer, but the first meeting was nearly blown away by a gale and after that there didn't appear to be many more night meeting. By 1939 many of the RSRC top riders including Aub Lawson were lured to race in England and then of course World War two broke out. The last meeting at the Bodes Oval complex appears to be on the 16th of July featuring bikes and the second annual mongrel dog race, this year the dog owner were requested to bring a lead. The WMCC used the track for practice on the 29th of October 1939, In 1941 Bodes Oval Estate was put up for auction for housing, This ended the Wollongongs prime sporting site and a short lived but spectacular Speedway venue. Although Aub Lawson lived in Willoughby Sydney, He became a WSMC member and in later years attributed much of his success to his experience racing at Bodes Oval. During World War Two Aub Joined the Australian Army and was a motorcycle despatch rider. 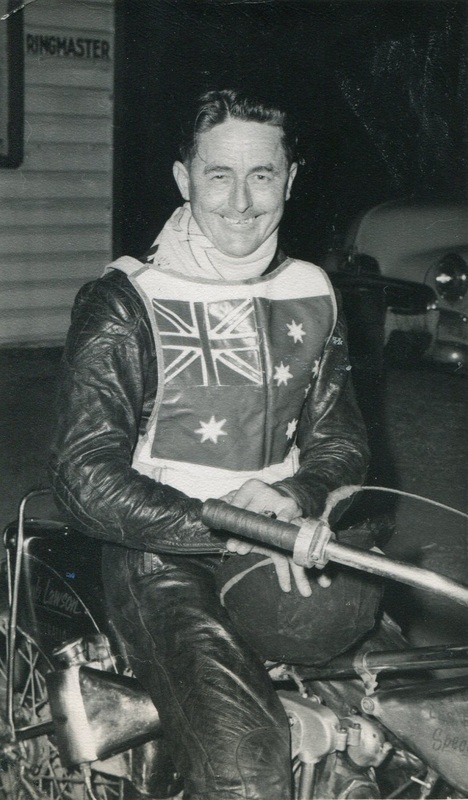 After the war Aub won the London Riders Championship in 1951, He also won state championships in New South Wales, South Australia, Queensland and West Australia in different years between 1948 and 1963.